Through Pioneer Hearts, a group I belong to on Facebook, 45 authors joined together to write 50 books in the American Mail-Order Bride series. 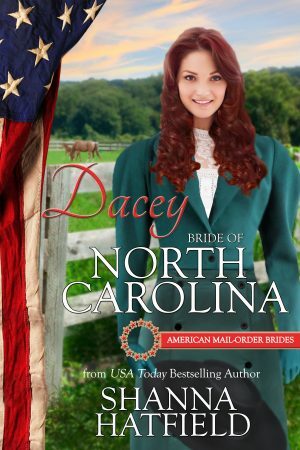 My book is Dacey: Bride of North Carolina and she is number 12 in the line up. Read this novella as a prequel to the Pendleton Petticoat series! “What in blazes do you think you’re doing?” Braxton swung over the fence in one smooth motion, carefully approaching the horse. It started to shy, but the woman bent over and whispered in its ear before patting it on the neck and sliding to the ground. In spite of himself, Braxton bit back a smile. Although the girl was of small stature, she possessed plenty of fire and sass. “Who gave you permission to ride?” He attempted to pin her with a stormy glare. Braxton experienced the most ridiculous desire to trade places with the horse. Aware it was crazy to entertain such thoughts, he couldn’t help but wonder what it would be like to experience such a tender caress from the fascinating female. You can see a list of all 50 books in the American Mail-Order Bride series and their covers here.